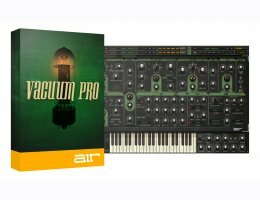 Vacuum Pro is a powerful combination of two separate synthesizer parts that can be stacked, split, and layered to produce big, wide, and fat analog sounds. Each Vacuum Pro part starts with two wide-range, vacuum tube oscillators that can be synched, detuned, and set to various octave levels. Plus, Quad Detune controls per oscillator make it easy to quickly dial in lush sounds. For an even bigger sound, the built-in Doubling effect instantly widens and thickens up your patch. Shape your sound with two vacuum tube filters that include a traditional low-pass filter and a selectable high-pass/band-pass filter. Vacuum Pro also has four envelope generators, matrix-assignable modulation, and a tempo sync’d LFO. The mixer offers a drive circuit and a tone-warping ring modulator. For authentic analog behavior, the Age controls let you manipulate the drift of and add dust to your sounds. Vacuum Pro comes complete with 350+ tweakable patches created by acclaimed sound designers Richard Devine and Mark Ovenden. You can load these patches separately into each Vacuum Pro part to combine and experiment with multi-timbral sounds. For instant sound inspiration, Vacuum Pro features Smart Sound Randomization, which randomly generates new settings for either part or both. Define which modules you want to lock at their current settings, which will be randomized, and then let Smart Sound dial in a patch for you. Vacuum Pro’s Smart page condenses all the individual parameter controls into eight macro knobs that enable you to quickly shape the sound of your patch without extensive tweaking. Macro knobs such as Punch, Emphasis, and Complexity add an intuitive workflow for perfecting your programming. Switch back and forth between the micro and macro modes to quickly edit or create your own custom sounds. 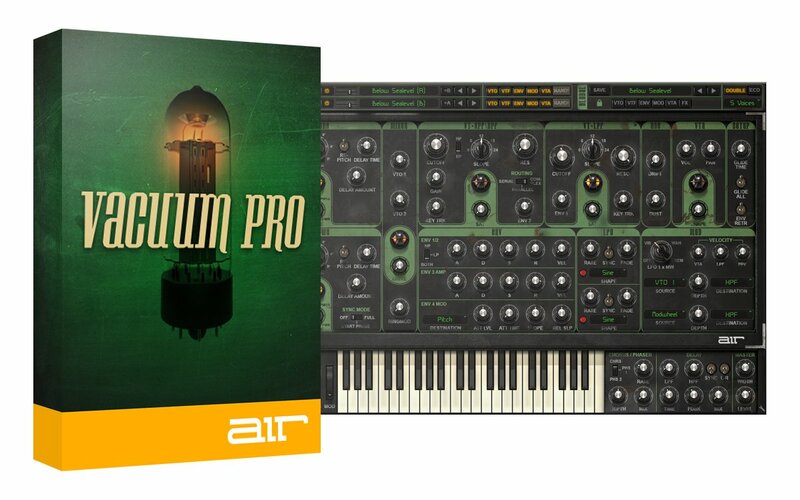 In addition to its authentic analog sound, Vacuum Pro includes a host of creative tools that are characteristic of classic analog synthesizers. An onboard arpeggiator, which can be tempo sync’d to your DAW, offers a quick way to build melodic runs and short sequences. A built-in chorus/phaser and delay effects give life and motion to your Vacuum Pro patches. Onscreen pitch bend and modulation wheels add extra expression to any performance, and all parameters are MIDI-mappable for performance ease and automated control.